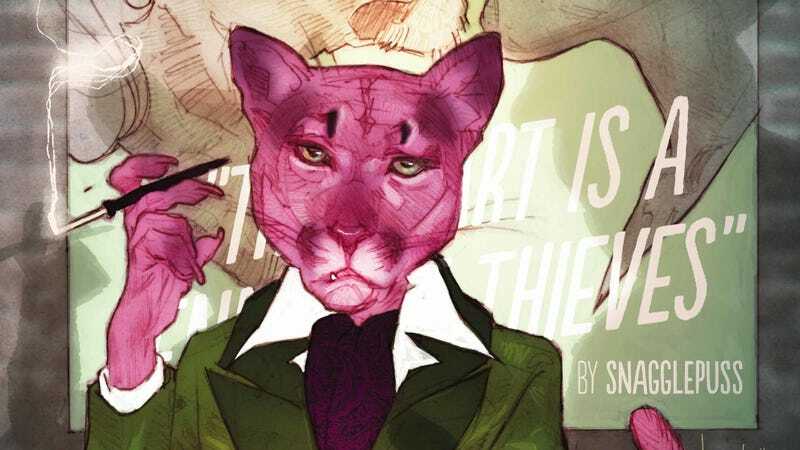 Making Snagglepuss gay isn’t much of a stretch for the lisping pink cartoon cat, but in the pages of Exit Stage Left: The Snagglepuss Chronicles, writer Mark Russell and artist Mike Feehan are using Snagglepuss’ sexual orientation to put him at the center of a tense political drama. After turning The Flintstones into a socially conscious satire of current events through a prehistoric lens, Russell is turning to one of the most harrowing periods in the history of the entertainment industry for Exit Stage Left, reimagining Snagglepuss as a gay 1950s playwright facing the threat of being blacklisted. There’s a cartoon influence in Exit Stage Left, but it’s not Hanna-Barbera. Instead, the team is channeling Bojack Horseman with its cast of humans and humanoid animals for a story rooted in one man’s emotional turmoil as fame fails to satisfy him emotionally. This exclusive preview of next week’s Exit Stage Left: The Snagglepuss Chronicles #2 begins with the main villain of the piece, Gigi Allen, who is spearheading a crusade to expose the perverts, junkies, and other undesirables she believes are corrupting the country. Snagglepuss is going to be the example that takes them all down, and Allen has pictures of him entering the Stonewall Inn, where he finds brief relief from the mounting pressures of his life. The artwork by Mike Feehan, inker Mark Morales, and colorist Paul Mounts maintains an element of realism, but it’s much cleaner and less textured than the visuals on The Flintstones, which helps bring more of an animation look to the story. This excerpt also includes two pages from the “Sasquatch Detective” back-up by writer Brandee Stilwell, artist Gustavo Vazquez, and colorist Chris Sotomayor, and it’s smart to use the Hanna-Barbera books to debut new concepts that capture the playful spirit of those old cartoons with a more modern sensibility.